Love it or hate it, Marmite is a permanent fixture in British supermarkets, and new YouGov data reveals how clever and creative marketing efforts have helped boost sales and perception of the brand. Marmite’s recent advert urges consumers to end #MarmiteNeglect. It’s a renewal of a previous campaign that was based upon the notion that many jars were left unopened in cupboards for months. YouGov BrandIndex data indicates the cut-through this has had with the public. Our Ad Awareness metric details the increase in the percentage of respondents that could recall seeing an ad for Marmite in the previous two weeks. 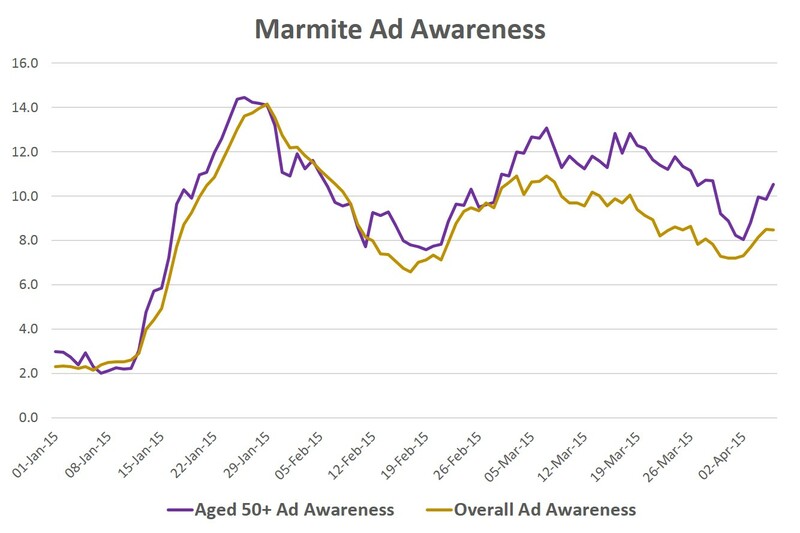 Marmite’s Ad Awareness has increased significantly from +2.3% prior to the launch of the campaign, to a high of +14.1% following it, underlying the success of the advert and theme. YouGov profiles suggests that the quintessential consumer of Marmite is a woman over 60 years old, who shops at Waitrose and has £1,000 or more a month free. Importantly, we see a greater increase in Ad Awareness among this demographic with the score peaking at +14.5%, underlying the success it is having in targeting a key market. How are Marmite performing compared to other brands within the industry? In the Dried Ambient Food Sector, Marmite’s Buzz Score ranking shows them at second in our list, suggesting that it has been a strong last 30 days. It has generated a Buzz of +5.9 which is high compared to many of the similar priced and positioned items in the industry. Creative campaigns and inventive use of the divisive nature of the product itself will remain crucial in Marmite’s positioning in the market. They have cleverly made use of the love it or hate message and incorporated it into their strategy. Brand loyalty from those who do confess to loving it is obviously key, but attracting more consumers to give it a try would lead to even greater returns.